Hardy to Zone 8 to 12, otherwise kept as a potted plant and brought in for the winter. I’ve seen these flower abundantly in December in a greenhouse Zone 6. (Hop Bush, Hopseed Bush, Ake Ake) Evergreen shrub or small tree to 15 feet. Can present as a multi-trunked bush that makes a good hedge, or can be trimmed up to a single trunk whereupon the plant becomes more like a tree. Native to the deserts of the American Southwest and also native to the tropics and warmer temperate zones worldwide. 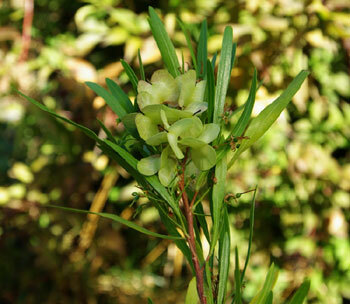 The plant is willow-like in appearance but extremely drought tolerant, and its most distinguishing feature is the highly decorative, papery 3 sided seed pod. Good choice for dry, full-sun exposure. Hopbush gains a local following wherever it grows, as the wood is extremely resilient (the Maori call it Ake Ake which means forever and ever) and excellent for tool handles and other crafty projects. The name derives from the flower’s resemblance to a hops strobile. The plant was once used to flavor beer. Traditional usage (TWM): gastroenteritis, stomach and duodenal ulcer, colds, toothache. The plant prefers full sun and very fast-draining, warm soil or sand/gravel mix. Scarify the seeds by putting in a glass and pouring boiling water on them. 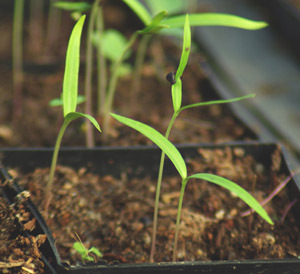 Leave soaking overnight and plant the next day in warm, fast-draining soil. Germination in 2 to 10 weeks. Work up in pots and transplant out when sufficiently large to withstand the stresses of living outdoors.